A great product for traveling is Sondre Travel Voyage Pillow is a compact travel next trip, adventure or daily commute pillow for you. 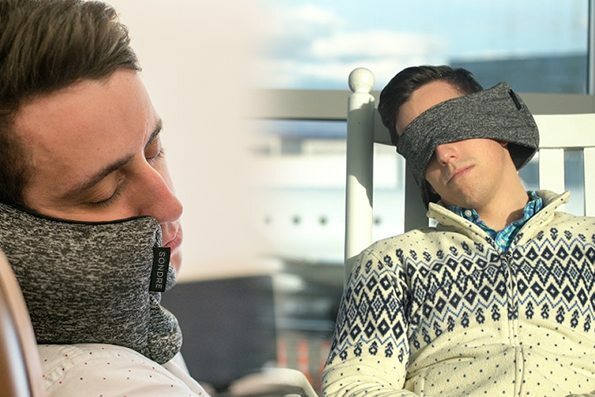 This unique 2 in 1 design combines a travel pillow and eye mask that features a sculpting microbead pillow with a signature poly/spandex band that allows you to customize the way you sleep. Because of the size, you can sleep in any position on the plane, it is very lightweight, made with comfortable fabric, can quickly be packed in your suitcase or backpack. You can get in the colors Midnight Black, Paris Green, Sunrise Red and Ocean Blue. My Opinion: It is so very soft and comfortable to use as a pillow and cover your eyes from the light. It was easy to fit in my suitcase or carryon bag I am very impressed with it and will make a great gift for anyone who travels a lot.